Best Wrinkle Filler | Injection Alternative Hides Frown Lines | No Needles! The Best Wrinkle Filler – No Needles, Instant Results. Dermaflage makes it easy to hide frown lines between the eyes with makeup because it actually fills in the deep wrinkles. The topical filler is medical grade silicone that starts in a honey-like consistency and dries to a film that perfectly mimics skin in under 3 minutes. If you’re tired of people asking you if you are tired or angry but dread the idea of injections, Dermaflage Topical Filler is your best bet. Read on to see how to see how this safe topical filler works. Our 100% Money-Back Guarantee gives you a hassle-free, risk-free way to try Dermaflage Topical Wrinkle Filler. We offer a full refund on starter kit purchases for any reason and a free color exchange if the shade isn’t a perfect match the first time around. Simply return items for a full refund or exchange within 30 days of your order. Though wrinkles and frown lines can show up at any age, nothing makes you look older (and grumpier) faster than a forehead full of frown lines, glabellar lines, or “11” lines. There’s a reason why today’s celebrities look rested and stress-free on camera (even in HD!) – Hollywood’s top makeup artists use Dermaflage to turn back time. This innovative silicone filler was expertly developed by special effects makeup pros who demand the best wrinkle filler with results that look like real skin, even up-close and in real life. Dermaflage is in a different league than wrinkle creams and anti-aging treatments that claim to “get rid of frown lines” completely. 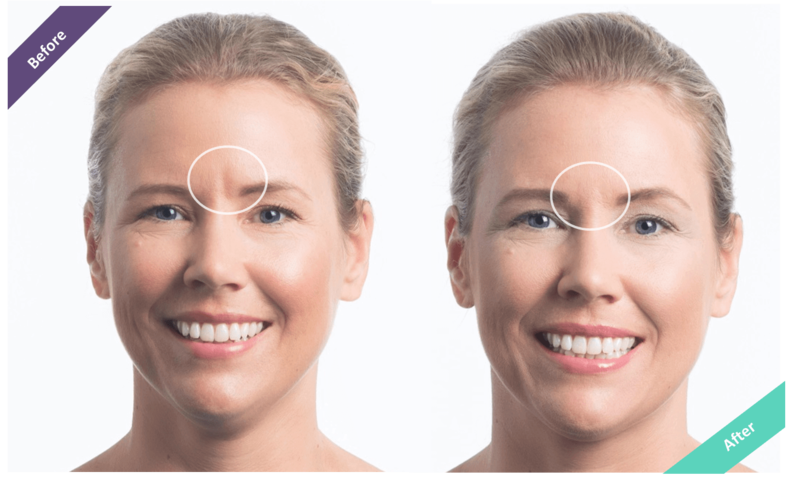 Instead, Dermaflage is an instant, age-defying and age-disguising solution to fill the frown lines and forehead lines that make us look older – including glabellar lines and “11” lines between the brows. Dermaflage helps you instantly look younger without painful injections, expensive procedures or downtime. Even the best wrinkle filler makeup like concealers, line-fillers and primers can’t achieve the results that make Dermaflage stand out from all the other products to diminish wrinkles. How Can I Get Rid of Wrinkles Naturally? Breakthrough Active Ingredients to Both Hydrate & Stimulate the Production of Collagen. We developed this cream to help our customers prevent new scars and heal old scars. However, the formula is an anti-aging powerhouse! It is an excellent daily product for everyone to use as a moisturizer, anti-aging cream and makeup primer. Good Skin is a corrective cream with some of the most powerful anti-aging ingredients to fight scars and improve complexions. Tired of People asking you if you are worried, tired or angry? Dermaflage topical filler is a quick fix for frown lines.